Warning: If you decide to read this book (which I force recommend you do), you may be surprised at the amount of smiling you will do while reading. At least, that's how it was for me. I kept going back and forth about if I should read this and then the publisher gave me a Netgalley link, so I thought, why not? It wasn't a life-changing, realistic book. It was a cute, smiling, wonderful book that kickstarted my reading again. I am still in awe of how Melissa Landers did it. It went from careful, I may have to start saying "whatever" to I can't stop reading in an impressive transition. First thing you need to know: Cara is competitive. We're told that right from the beginning, from the very first line actually. Because of that, she snags the valedictorian slot in her school and then is surprised with a prestigious scholarship. The catch is that it involves a student exchange with a L'eihr, a.k.a. an alien. Her parents and principal are all gung-ho about it, but she has doubts, especially since her jerky boyfriend is anti-alien. Nevertheless, she agrees. When we were first introduced to Cara and her social life, I had a sinking feeling in my stomach. Oh no, not another controlling, jerky boyfriend, who she'll be conflicted in whether or not she should break up with him or not, but we all know that she should...that kind of feeling. Thankfully, Landers knew what she was doing and fixed that problem very quickly. I won't even touch on that pesky best friend business she had going on though. Another plus in Landers' favor? Providing pronunciation for the aliens' names! Hurray! She does it in a smooth way that made me sigh with relief because I can barely pronounce normal English words, don't make me try to pronounce names that are spelled weird. Not only that, but she also makes us feel the differences between aliens and humans. They aren't just people who were born on a different planet, they had a completely different culture, attitude, upbringing, and complexities. They felt foreign and I always looked forward to learning more. But let's be honest. The building romance and feels between Aelyx and Cara was like a flutter-fest for me. My heart fluttered, my hands fluttered, and I wouldn't doubt that my eyelashes fluttered because I was a fluttering mess. I don't do well in embarrassing situations, even fictional ones, but Landers pulled this off excellently. There were awkward scenes that made me adore the story more. Then not-so-awkward ones that got me fluttering again. Things did get heated, but not too far, and once again, Landers pulled it off well. Standing ovation for her, yes? While she was still toying my emotions, Landers then decided to heat up the other side of my brain: anger. I was angry. Not at the writing or the story, but the characters. Then it wasn't even the characters themselves, but how realistic they are to our society. Aliens and other scary things are happening. So of course, humans will start to overreact and become hurtful and violent. They turn on their neighbor, they become insistent that they are right and they basically make everything 100x worse. Cara's situation goes from being a great experience for her and Earth to needing guards and being shunned from everyone. It was awful because I could see that happening. Hey, it probably has happened many times throughout history. Something scary happens and we all panic and create hurtful groups like Alienated's HALO. But let's not forget the other side, shall we? The aliens weren't completely blameless either. Aelyx and the other two exchange students, especially the girl, decided to do something that they thought was in the best interest of their planet, but ultimately, they were teenagers thinking that they knew best (of course, adults have many of those moments as well). This story was all kinds of laughs, smiles, flirting, blushing, and fluff. But then Landers sticks in this aspect that actually added depth into the silliness, making me appreciate the novel so much more. Since this book was such a win for me, I hate to touch on anything negative because I felt like the positives blew everything out of the water. Alas, I have to. That ending. There was one part with her parents that felt wrong to me, but I reminded myself that this was a fun book, I shouldn't focus on it. Then we get to the actual ending and hello, sinking feeling. I really can't say much (since it is the ending), but I dread the direction it seems to be taking. I'll be one of the first to request the sequel, but I hate the implication that started forming in the last few pages. Verdict: DISNEY-HYPERION FOR THE WIN! Thanks, Rachel! That's a good strategy. And then once another book comes out, you feel like you have to reread and that takes up even more time. I've never been a fan on those alien-based novels, but somehow I am strangely attracted to this book, so I think I'm going to give it a try. Bummer that the ending isn't that good, though. You should! I thought I wouldn't like it as much as I did. 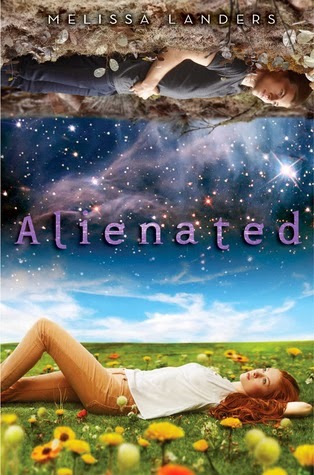 I'm really excited to read Alienated! It sounds like such a great book, a good combination of fluffy and serious. Your review definitely gave me that impression, and added to my anticipation. You have it spot on! HOW THEY SHOW AFFECTION MADE MY FACE REDDEN! Wowza, talk about steamy. Oh cool, I'll check it out! I regret passing this up on NG. At the time I had a couple other alien books and didn't want to get burnout. I'm still going to read it though, because this publisher hasn't steered me wrong yet. This review. Maybe I'm biased because you make the book in question sound like a total "me" book, but I love this review. Competitive main character? Yes, please. Pronunciation? Thank you, Landers, for including that because I can barely pronounce normal English too. Anger-inducing prejudices? I want this book right now. Thanks for convincing me on this one! I'm glad you enjoyed it so much, and I hope I do too! Heather really enjoyed this one too, as evidenced by her comment above. :P She reviewed it for us, and between her review and yours, I'm really digging the concept of this story. The depth beneath the fun and lightheartedness makes me excited! I'm not sure when I'll get around to reading this one, but if my library gets a copy anytime soon, I'll be snagging that baby up. Lovely review, Summer! I wasn't expecting such a fun, light-hearted read either, but I really enjoyed this one. I'm glad that it took a turn for the serious when it needed to, but I enjoyed the awkward interactions, too. I don't like what's hinted at in the ending either, but a friend assured me that she'd heard (indirectly) from the author's mouth that it doesn't go in that direction. So, we'll see, I suppose. Great review! WHEW. I really, really hope she indirectly heard right.